The University of Georgia School of Law honored four individuals for their service during the school’s Fourth Annual Alumni/Alumnae Weekend. Larry D. Thompson, Don L. Waters and Sally Q. Yates received the law school alumni/alumnae association’s highest honor – the Distinguished Service Scroll – for their outstanding dedication and service to the legal profession and the law school. Thompson currently holds the John A. Sibley Chair of Corporate and Business Law at the School of Law, and also serves as the independent compliance monitor for Volkswagen. He previously served as executive vice president - government affairs, general counsel and corporate secretary for PepsiCo. He also has extensive experience in the public sector. In 2001, the U.S. Senate confirmed Thompson as deputy attorney general of the United States after his nomination by President George W. Bush. From 1982 to 1986, he served as U.S. attorney for the Northern District of Georgia where he led major political corruption and drug trafficking prosecutions brought by the U.S. Attorney’s Office. His award was presented by King & Spalding partner and 1988 School of Law alumnus Paul B. Murphy. Waters is chief executive officer of Waters Capital Partners and a member of the University System of Georgia Board of Regents. He is a 1978 alumnus of the School of Law. From 1993 to 2016 he was chairman, president and CEO of Brasseler USA, which manufactures dental products and instrumentation. Prior to that he practiced as a certified public accountant, as a partner with Price Waterhouse & Co. and as an attorney with HunterMaclean. A native of Savannah, Waters currently serves on the Board of Trustees of the Chatham County Hospital Authority, the Board of Trustees of the Augusta University Health System and the Board of Curators of the Georgia Historical Society. UGA President Jere W. Morehead, a 1980 alumnus of the School of Law, presented his award. Yates, a 1986 alumna of the School of Law, has served in several leadership roles during her career – most recently as acting U.S. attorney general and as deputy attorney general, a position to which she was appointed by President Barack Obama. She also served as U.S. attorney for the Northern District of Georgia, during which time she prosecuted white-collar cases as chief of the Fraud and Public Corruption Section of the office. She was first assistant U.S. attorney of the office and lead prosecutor in the case against Olympic bomber Eric Rudolph. Prior to joining the U.S. Attorney’s Office, she practiced law in the Atlanta office of King & Spalding, where she specialized in commercial litigation. Her award was presented by 1986 alumnus Daniel P. Griffin, who is a member of the law firm Miller & Martin. Additionally, the Young Alumni/Alumnae of Excellence Award was presented to 2008 alumnus Cameron D. Hawkins, who is a trial lawyer with Busby Negin specializing in civil litigation. He currently mentors moot court and mock trial teams statewide, including service as an assistant coach for the Morehouse College Moot Court Society and also assists with the Davenport-Benham: Black Law Student Association moot court competitions. In addition, he serves as an instructor for the Fulton County Youth Leadership Academy for Boys. Former Fulton County Superior Court Judge Gino Brogdon Sr., who currently is an attorney and mediator, presented Hawkins with his award. Other highlights of Alumni/Alumnae Weekend included: a keynote address at an awards ceremony by U.S. District Judge for the Northern District of Georgia Steve C. Jones, who is also a 1987 graduate of the School of Law; the annual Equal Justice Foundation auction, which raises money to fund summer public interest fellowships; a Leadership Circle reception for law school annual donors and a cocktail reception hosted by the law firm Blasingame, Burch, Garrard, & Ashley, P.C. Note to editors: A photo of the award winners is available at https://news.uga.edu/wp-content/uploads/2018/04/four-award-winners-and-dean.jpg. 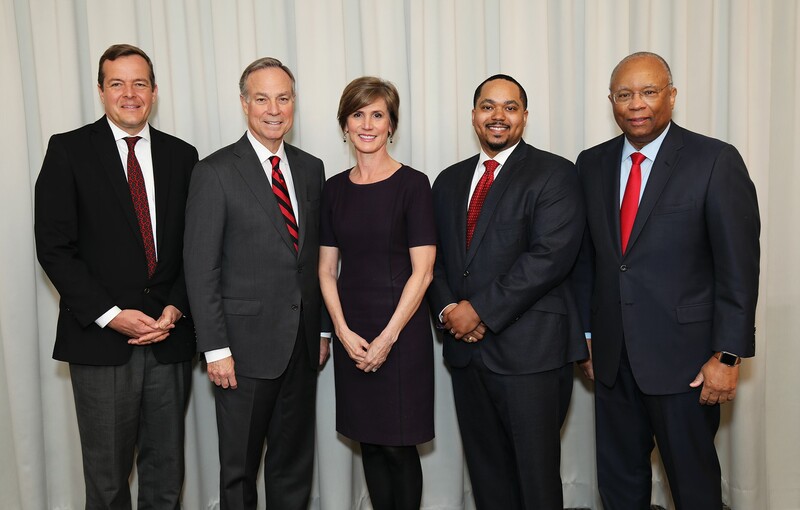 From l. to r.: UGA School of Law Dean Bo Rutledge, Don Waters, Sally Yates, Cameron Hawkins and Larry Thompson. Photo by Ian McFarlane.